Check out one of our favorite NBA DFS tools over at Fantasy5x5 – This stats driven tool is specifically for basketball with all the info you need to know. This article covers playing fantasy basketball at both FanDuel and DraftKings – you can read reviews of these sites here to learn more and get signed up. I have also put together a FanDuel VS Draftkings NFL Guide that compares playing fantasy football at the two sites. Update for the 2018 season – Draftkings removes late swap from NBA games. Now they only offer the same style of games as Fanduel where games lock from early to late that night in NBA at the first tipoff. No longer do you need to scour twitter for hours on NBA night in order to be successful on Draftkings NBA games. Whether you are entering a low-stakes head to head matchup or a tournament with a large prizepool, your fantasy NBA team on Fan Duel will consist of no more than 9 players. 2 PGs, SFs, SGs, and PFs will be accompanied by one Center to fill out your squad. When drafting a team, whether it is for a league, a tournament, or otherwise, you will almost always have a salary cap of $60,000. The value of the players in which you draft are determined by overall skill and recent performance, making it almost impossible to draft a team with more than one or two superstars and still have an effectively balanced squad. The way a daily fantasy basketball team is setup on Draft Kings differs slightly from that of Fan Duel. First and foremost, Draft Kings daily fantasy basketball NBA teams only consist of 8 players. Your team’s 8 players will be comprised of a PG, SG, SF, PF, C, G, F, and a Utility player. The way in which players are valued on Draft Kings is very similar to the way they are valued on Fan Duel, though the salary cap for drafting a team on Draft Kings is only $50,000. 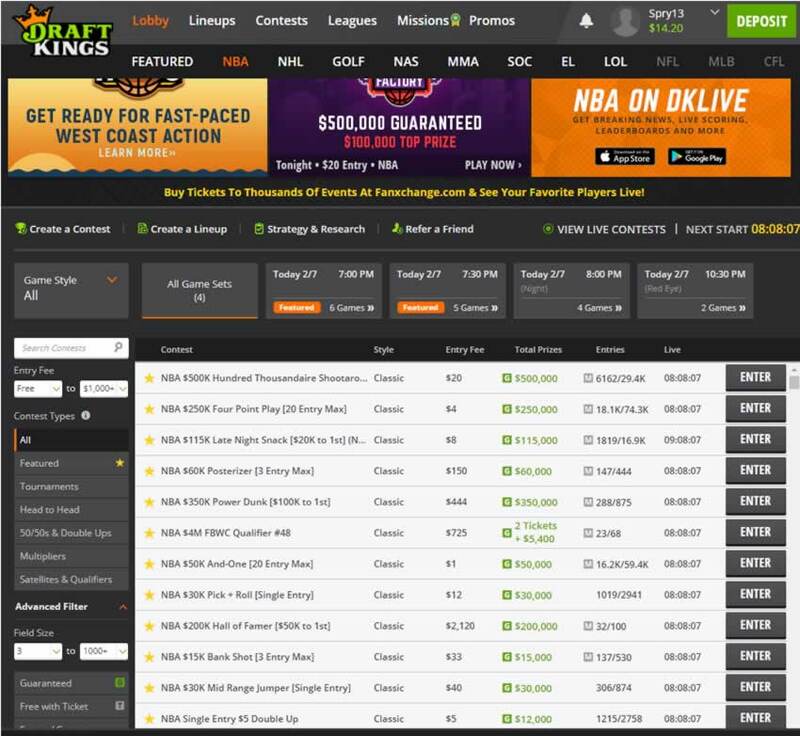 Like Fan Duel, Draft Kings also plays host to 50/50s, Head to Heads, tournaments, and leagues. If you take a look at the daily fantasy basketball contests on both Fan Duel and Draft Kings, you won’t notice too many differences on the surface level. Both sites have a similar setup that is easy to follow and is incredibly informative. They both have many of the same contests (50/50s, head to heads, leagues, and tournaments) as well. Because of this, we figured it was best to take a look at each site separately to help you take note of the minor, yet incredibly important, differences. In all, the way in which you draft players on Fan Duel and Draft Kings is none too dissimilar. While the salary caps and individual player values will vary slightly, they are, for the most part, proportionally even. The biggest difference we found between playing fantasy basketball at either Fan Duel or Draft Kings is the difference in the scoring schemes found on both sites. Because your players can earn points through double doubles and triple doubles, the scoring scheme on Draft Kings seems to give your fantasy team more chances to score. Not only that, but Draft Kings also punishes your players less for turnovers (-.5 vs -1). The added opportunity for your player(s) to earn additional points through double doubles and triple doubles makes players like Lebron James and Kevin Durant, who earn double doubles with regularity, inherently more valuable players on Draft Kings than they are on Fan Duel. This is a blessing, but it can also work against a daily fantasy basketball player should their team’s all-star(s) not perform up to par on any given night.